Insiders have told the BBC these numbers could be masking an even bigger problem. They said there was a reluctance to accept that staff were suffering and managers were not trained properly. BBC Scotland's The Nine spoke to a paramedic who was diagnosed with PTSD (Post-Traumatic Stress Disorder) last year. Ewan, not his real name, said: "Some days you see horrific stuff like dead and dying children." He said paramedics learned to shut off their emotions because it was seen as "a sign of weakness". "This is the job I signed up for but no-one trained me to tell a mother her child is dead," he said. Ewan said the trauma of the job gave him nightmares, he was not sleeping and his mind was racing day and night. The doctor referred him to mental health support. "They said I scored higher than someone who had been in a war zone," he said. Figures from a Freedom of Information request showed that 151 paramedics took time off sick with anxiety, stress or depression in 2018, a 42.5% rise on the 106 the previous year. In total, 9.5% of the 1,582 paramedic staff in Scotland were off sick with stress-related illness during last year - taking an average of almost eight weeks each. Technicians, schedulers and other staff in the ambulance service have all seen a rise levels of sickness related to stress and anxiety. A former senior manager in the service, who we have named Sarah to protect her identity, said the problem could be even bigger than these figures indicate. "It is definitely increasing," she said. "I think there is a reluctance to accept that our staff suffer from PTSD and it's scary how little support there is for them. "The training provided to managers to help deal with cases isn't adequate. "I didn't feel I was equipped with the skills I needed." The Nine spoke to two former paramedics who took early retirement after being diagnosed with PTSD. Kevan Kearney said paramedics should not become desensitised to other people's trauma but that was the way many try to cope. "Then that passes and you start to take it home with you," he said. "You don't sleep because you are always questioning yourself 'could I have done better? Could I have saved that person'." Lawrence McErlane said the trauma started to "eat away" at him in his last couple of years as a paramedic. The final straw for him was a baby that had been lying dead in his cot for seven months. For Kevan it was a similar experience. He said: "In the space of just a few days I also had a cot death and a chap jumped from the 15th floor of a tower block and we were first on the scene. "The next day there was a traumatic incident with an eight-year-old boy and I never really recovered from that." Kevan said the stress of the job tested his relationship with his wife and son. "It is only because my wife is such a wonderful person that we are still together because I would not have lived with me," he said. After he left the ambulance service Kevan said he became a virtual recluse while Lawrence said he drank heavily. Both said they knew people still in the service who were clearly "dysfunctional" in their lifestyles and the way they related to patients and relatives. "They have morphed into that because of day-to-day intense exposure to extreme situations without anyone lifting a hand to say are you ok?" Kevan said. Lawrence said that on one occasion after he had attend the death of a baby he went back to the station because he felt he needed a break. "Within 40 minutes the radio went and asked if I was ready for the road yet," he said. The former paramedics called for continuous assessment of the mental health of paramedics. 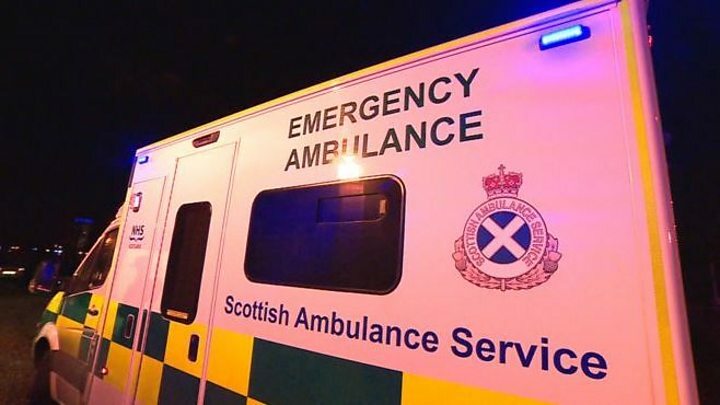 A Scottish Ambulance Service spokeswoman said: "We know our staff occasionally experience stressful situations and we take their mental health very seriously, which is why we have developed a robust programme to support them. "We have plans to expand the support we offer."